I have been using my bullet journal for two weeks now. During the first week, I carried my Passion Planner as well, so that I could learn how to plan with my new journal while not losing the benefits of my existing planner. But going into the second week, I left my Passion Planner at home. 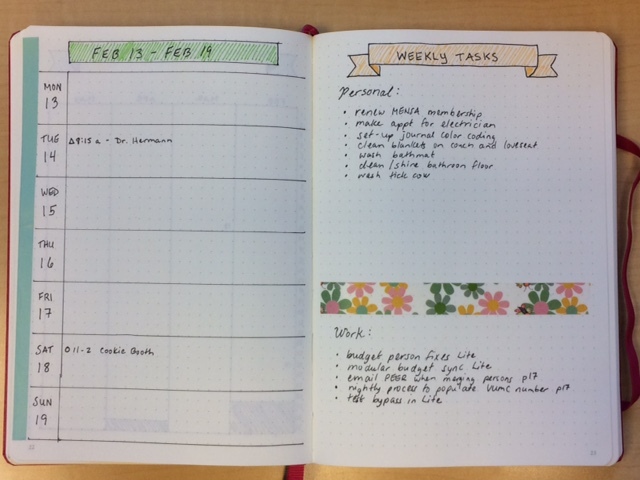 The bullet journaling system is nothing short of amazing! I am already reaping the benefits of using a planner / journal that is customized to my needs. The first week, I devoted an entire Saturday to setting up my new bullet journal. I hit Pinterest (which is rife with bullet journal ideas) and pinned some of my favorite monthly, weekly, and daily spread ideas. I set up my key and future log on the first few pages. For my first monthly spread, I decided to keep it simple, so that I could focus on the actual journaling rather than getting bogged down in the design process. However, I knew I wanted to include some monthly logs and trackers in addition to the standard monthly calendar. After all, that was one of the reasons that I switched away from my Passion Planner. So I decided to include a monthly memory log (pictures and doodles of things that happened during the month), a habit tracker, a health tracker, a gratitude log, and a meditation log. Next, I set up my weekly spread. This consisted of only two pages: a weekly calendar for appointments and events, and personal and work task lists. The first week, I also included “Priority” and “Goods Things That Happened” areas on my tasks page, but I quickly determined that I needed more room for my task lists. So in the second week, I eliminated the “Priority” area. (In the bullet journaling system, you can designate your priority for the week with an asterisk next to the task, so that area was actually redundant.) And I will be moving the “Good Things That Happened” area to the end of my daily logs, as part of a weekly wrap-up. I later added a small area to schedule my runs for the week, and track a couple of one-week habits (for example, this week, I am eating a salad every day). Next come my daily logs. Each morning, I start a new area for that day’s log. I write in the day of the week and calendar day, and draw a little icon for that day’s weather. Then, I check my online Google calendar, my future / weekly log, and my calendex (more on that later) for any appointments or events for that day, and record them at the start of that day’s log. I scan back through my weekly tasks, as well as any unfinished tasks from my dailies, to determine what I want to work on for that day. As new tasks arise, I simply record them as a task in the daily area. At the end of the week, I migrate unfinished tasks to my weekly task list for the next week. I am also using a calendex to track appointments and events. This is a type of future logging which uses journal page numbers to indicate appointments, events, or information on a calendar-like spread. It seems confusing and overly complicated at first, but after using it just a couple of times, I am already in love with it. There are great explanations and examples of the calendex method at Bullet Journal and Boho Berry. So how is all this helping me? Well, I love that I have unlimited space for tasks. I just record them as they come, and check them off when they are done. After team meetings at work, I usually come away with several small action items that I need to address. Until now, I have been writing them down as part of my meeting notes, where they immediately become jumbled up with all my other work notes. Now, I can transfer them to my bullet journal so that I don’t lose track of them. At the end of each week, I move any unfinished tasks that are still applicable to the new week’s task list. I also love the daily tracking for habits and health. For February, I decided to perform the following “habits” each day: hydration, shoulder therapy exercises, meditation, a walk or run, and clearing the sink of dishes each night before I go to bed. Just knowing that I get to mark off that little square when the habit is complete can be the difference between action and inaction! As a side note, the whole family has gotten on board with the clearing the dishes thing. It has made a world of difference in the tidiness of our kitchen. Also, no more squabbles over whose turn it is to do the dishes – it always everybody’s turn! Clean kitchen, happy family. I have also been tracking my health daily, in an effort to identify how my habits effect how I feel each day. I record mood, energy, and overall health each day as a dot on a little graph. I also like that if a layout or tracker doesn’t work for me, I can change it. I am limited only by my imagination! At the end of February, I will have a review (with photos) of my first month in my bullet journal, as well as some reflections and musing on what worked for me and what didn’t. But so far, I can truly say that the bullet journaling system works for me. Organizing, journaling, planning, task management, and creativity, all rolled together. What could be better?